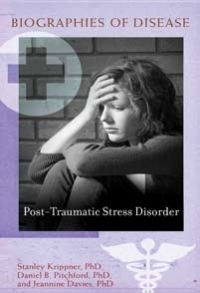 Congratulations to my friends and colleagues, Stanley Krippner, PhD, Daniel B. Pitchford, PhD, and Jeannine Davies, PhD, on their new book, Post-Traumatic Stress Disorder. The book was just published, in March 2012, by Greenwood Press, in their Biographies of Disease series. Stanley and Daniel are both faculty at Saybrook University, and we have held residential conference programs together, on a mind-body understanding of trauma. Jeannine is currently pursuing her doctorate at Saybrook. This book is valuable because it highlights some areas not touched by other works on PTSD. For example, it shows how post-traumatic growth can unfold, creating in the person post-traumatic strengths never present before. Stanley Krippner has written extensively on trauma, including his previous work, Haunted by Combat, which he wrote with Daryl Paulson. In that book, Stanley and Daryl applied the personal mythology approach to the experiences of traumatized veterans, and showed how traumatized individuals are shaken and disrupted in the basic unfolding of their personal story, by trauma, and how they can also be spurred to new personal growth and transformation by such experiences. Stanley Krippner applies the work of Joseph Campbell and others to illuminate how we create our own life myths, which in turn give direction to our lives.